Patricia Louise Corbett is a Wallingford, CT based oil landscape painter who sells her art mainly on the east coast. She has become known and appreciated for her mixture of the French and Californian impressionistic style. Her early life as a touring concert artist gave her the opportunity to view the works of early masters throughout the world. In 1997 after a bout with cancer she decided to go back to her childhood love. She began by studying with Julie Gale in New Jersey. But it was in 2005, when Patricia decided to study with her brother, Ray Carpenter, that a whole new world opened. Mr. Carpenter is renowned for his landscape paintings which are presently being exhibited in several prestigious galleries on the west coast, one being the Carmel Masterworks Gallery. Creating art with her siblings is not new to Patricia. As a young girl, she spent hours in her backyard drawing with another sibling, Michael Carpenter, a successful landscape artist in Santa Fe, New Mexico. 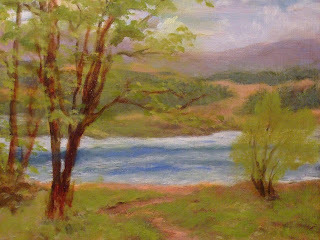 Both of her brothers’ scapes depict the rugged western terrain, however, Patricia has found her calling with the eastern scenes with their many lakes and lush multi-colored landscapes.